The aim was to design a memorial that honours a great Bishop of Liverpool, citizen, husband, father, and friend, in a contemporary form, that will be a positive addition to the cathedral. It is a contemporary interpretation of a traditional memorial stone. The artwork has an abstract form, that communicates on many levels. 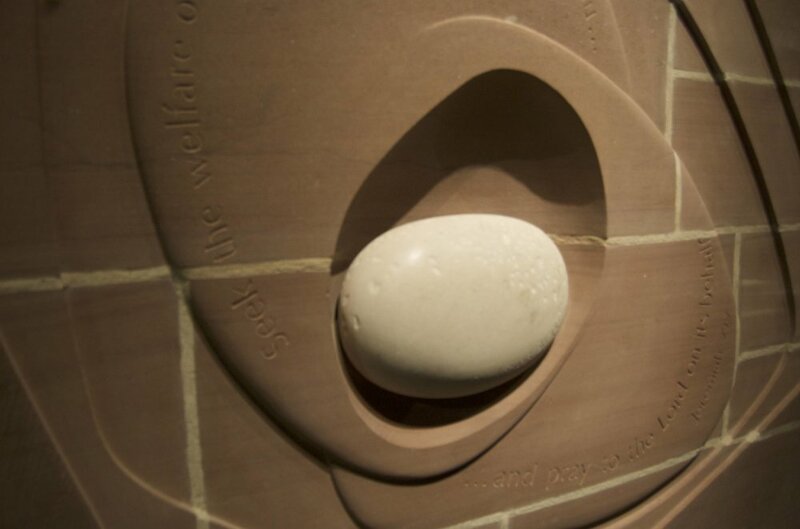 A white portland stone is set in the sandstone wall of the cathedral, creating a feeling of being 'embedded' or 'making an impression', with the sandstone representing the wider city. It is set at a height where visitors are able to touch and engage with it. This contemporary memorial stone, was designed to evoke a sense of intrigue and wonder. The abstract nature of the work communicates on many levels and permits a range of thoughts, whilst adding a spiritual dimension to inspire reflection in a personal or corporate way. A white Portland stone is set in the sandstone wall of the Cathedral, creating a feeling of being 'embedded' or 'making an impression' with the sandstone of the cathedral representing the wider city. be hand-carved following the curve of the stone. The floor plaque directly below the artwork covers the casket of Bishop David and Grace, Lady Sheppard; whose ashes were interred on 6th May 2011 to be alongside her husband. The Sheppard memorial was dedicated at a ceremony on 7th May 2011 by the Dean Justin Welby, in attendance was David and Grace Sheppard's great friend Archbishop Desmond Tutu. The memorial was funded by more than 200 individual donors. Honours a great Bishop of Liverpool, citizen, husband, father, friend. Evokes memory and remembrance, expressing the spirit of the man. Has a sense of intrigue that inspires discovery and wonder. Is a contemporary interpretation of the traditional memorial stone, in the spirit of Tyson Smith's low-relief memorials. Is appropriate in scale, form and materiality. Can be seen as an artwork in it's own right, and a positive addition to the fabric of the Cathedral. The white stone was shaped out of portland stone. It has a tactile quality with deliberate tooling marks. 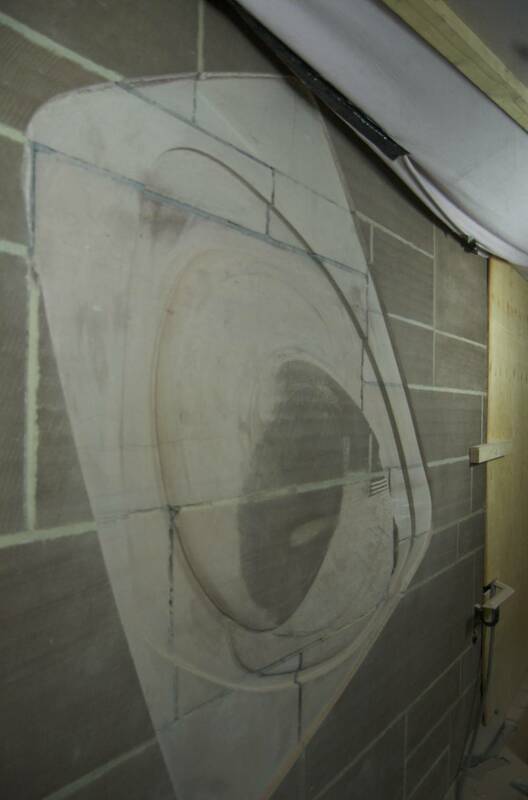 The design was marked out on the sandstone wall of the Cathedral and carved predominately by hand, with some of the heavier initial work using air chisels, at special times negotiated with the Cathedral. A screen was built to control dust and protect the visitors and staff of the Cathedral. Public viewing of the carving was made possible through a perspex window. The re-grouting of the blocks was carefully done to achieve a matching colour and texture, and the white stone securely resin anchored into the dished shape using stainless steel stud bar. The font chosen is Optima, used on the Vietnam Memorial in Washington, it has a more contemporary feel with a suggestion of a Serif, an alternative considered was 'Joanna' which was designed by Eric Gill, named after his daughter. The carving in the white stone was 20mm tall with a traditional v cut, and the carving in the sandstone is 50mm tall with a shallow flat bottom blasted effect. Directly below the artwork a granite floor plaque cover the ashes of David and Grace, it has their formal titles and dates carved and filled smooth in a contrasting colour. The stone carving was completed by the stonemason Adrian Wright over a 6 week period.